In 1996, Spike Lee became a trendsetter in urban fashions. He asked baseball cap giant, New Era, to create him a red New York Yankees fitted. It was the first of its kind. 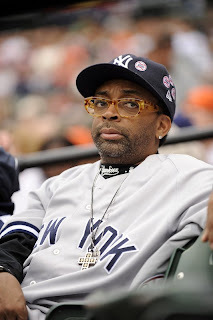 With all the alternate colored/non-traditonal baseball caps people wear today, who would've thought that Spike Lee was the first person to have one. In honor of Spike's pioneering request, New Era has created the Spike Lee 1.0. 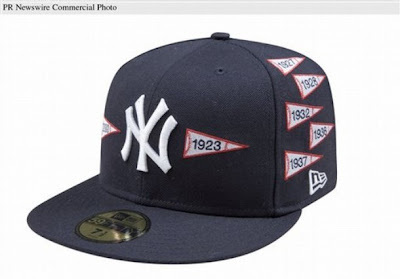 It is a limited addition, navy blue New York Yankees cap, that features each of the 26 championship pennants that the Yanks have won. This hat will be the first of the, "A Spike Lee Joint" Collection, which, starting with the 1.0 will be created and released annually. The hats will be available on July 12, 2008, and can be pre-ordered here. That's interesting to know. Wish Spike would've made his own hat company instead of partnering up with people. I am a Dodger fan anyway so good luck Spike with the Yanks.